Website Malware : A newer form of malware is what can be found attacking websites today. In the old days malware was mostly in the form of computer viruses. In today's age of globalization, malware starts to target websites and mobile devices. Almost 100's of Pakistan Government sites are under attack by Godzilla Malware, Which is Created and implemented by an Indian Hacker. 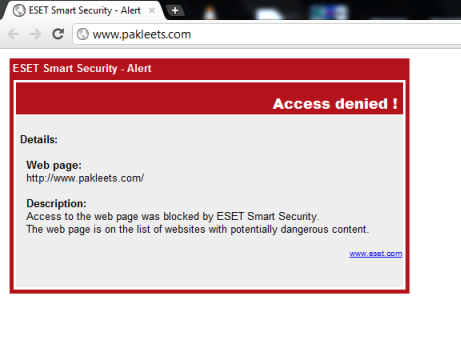 Hacker named "Godzilla" publish a list of all Freezed sites list here ,including Peshawar Electric Supply Company website (www.pesco.gov.pk), Ministry of Information and Broadcasting - Government of Pakistan website (www.infopak.gov.pk), Pakistan Navy website (www.paknavy.gov.pk) and Many more. Hacker said,"The malware is freezing the sever and if the server is changed then banner of malware hits the live ip.."
Today malware is much more sinister. It is backed up by an industry which some estimate at $2 billion a year. It is all about making money. Get More Malware News on The Hacker News.